Chelsea Football Club and Joe Wicks, the Body Coach, teamed up at Stamford Bridge yesterday for the first ever HIIT (high intensity interval training) session inside a football stadium (Monday 28th May). 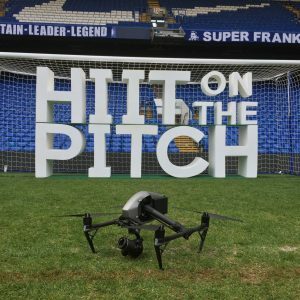 Joe lead two pulsating sessions, on the hallowed turf at Stamford Bridge which we streamed live footage of from the air using our Inspire 2 with 1080 output. 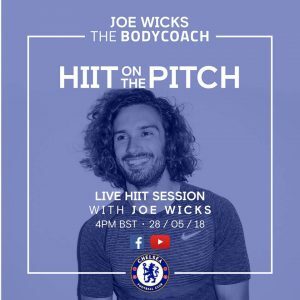 Joe said… ‘I’m absolutely buzzing to be hosting two HIIT sessions at Stamford Bridge,’ Wicks said. ‘We’re going to have almost 1000 people training together. What a way to kick off the summer. Live footage was streamed on Chelsea FC’s Facebook and YouTubepages. For more information on our drone services including live streaming, click here. Contact us on 0208 166 9712 or email us below and lets have a chat.